Otello had been a rarity at the Met during the first half century of the work’s existence. A single performance with de Reszke in 1891, four with Tamagno in 1894/1895, four with Alvarez in 1901/1902, eleven with Slezak between 1910 and 1913, then nothing until December 1937 when Martinelli assumed the role for the first time. From then on, it became a regular feature, firstly as Martinelli’s exclusive property until his retirement from the Met in 1945. Torsten Ralf and Ramon Vinay sang some performances thereafter, but for many it was only with the appearance of Mario del Monaco in 1955 that there was a true successor to Martinelli. I was particularly interested in this recording because I thought that it really was time I listened objectively to del Monaco after decades of dismissing him. The roots of my antipathy go back about 40 years, when I acquired, pretty well by chance, the Decca LP of excerpts from Zandonai’s Francesca da Rimini with Olivero and del Monaco. I fell head over heels with both the music and Olivero, but del Monaco seemed to do everything in his power to ruin the experience. It was undoubtedly a fine voice, but his model for the role of Paolo il Bello (!) seemed to be that of a rag and bone man coming calling down the street. I found what he did on that recording simply unforgivable. My feelings began to soften a few months ago when I read a passage from an interview with Olivero included in the third volume of Stefan Zucker’s Franco Corelli - a Revolution in Singing. She recalls that recording session: “When he listened to the playback he exclaimed ‘I can’t believe it! After [you sang] that soft poetic phrase I come in and what do a sound like - a boxer punching with his fists!’ He recorded the phrase again, but the second attempt more or less was the same because he was incapable of singing piano. He was furious with himself because he wanted to. He tried everything, but his technique would not permit him to sing softly since it was totally based on the muscles” (p. 214). It is difficult to feel so antipathetic towards someone who so clearly wanted to do the right thing but simply could not because of circumstances beyond his control. 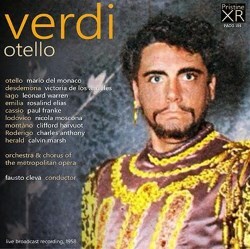 So, has listening to de Monaco’s Otello been a revelation of quality unfairly dismissed? The answer must be a resounding “yes”. Del Monaco was never a deep musician, but nor, in fact, was he simply the stereotype of the big dumb tenor whose only wish was to wow the gallery. What this recording showed me was that his musicianship, though instinctive rather than rational, in this role at least provides a gut truth which is often outside the ability of more intellectual singers. I never though I would ever utter this phrase, but as Otello, del Monaco’s assumption is more successful than Jonas Kaufmann’s. What he has which Kaufmann cannot provide is an animal unpredictability and raw intensity without which the character of Otello cannot really work. I love Kaufmann’s work, but he is a creature of the intellect, whereas Otello thinks with his blood. No-one who is essentially rational could fall so completely for Iago’s machinations. The first act of Otello is one of the most difficult beginnings of any opera for the tenor. The obvious first difficulty is that he has to come on and, without so much as a semiquaver’s warming up, sing the “Esultate!”. These few seconds are vital for the character because if, as Aristotle said, a tragedy is the fall of a great man, then this is all that Otello has to demonstrate his greatness. Two present-day cultural trends are positively designed to make that almost impossible to achieve. Firstly, the very idea of the hero who stands and triumphantly proclaims news of his success in sending the enemy to the bottom of the sea would now be seen as a textbook example of “toxic masculinity”. Secondly, in our mincingly come scritto age, conductors no longer allow the freedom of declamation needed to do this and demonstrated by such early singers as Tamagno (the role’s first singer), Zenatello and Martinelli. Secondly, when Otello returns at the end of the act, he must sing a Love Duet which requires exactly the sort of long-breathed, legato lines and poised pianissimos that are the very thing that heroic tenors generally find the most difficult to manage. Certainly, both Zenatello and Martinelli (Tamagno did not record anything the from the Love Duet) are at their least successful in this section. Del Monaco lived before these two problems reached the acute stage that they have today. His “Esultate” positively struts and exhibits the sort of freedom within a basically very slow tempo that Tamagno uses. The trumpet-tone and superb breath control make this exactly what an “Esultate” should be; there is no doubt about the heroic accomplishments of this character. “Abasso le spade”, when Otello re-enters to quell the fight, exhibits the same quality. When he moves into “Già nella notte densa”, we see that problems begin. The dynamic is reasonably quiet, but there is a definite feel of the tightrope walker here. The voice does not move easily and the pitch is sometimes approximate; the G flat on “immenso” is not a comfortable note. The more vigorous middle section of the duet suits him better. He tries hard with “Venga la morte!”, but the inability to sing really softly noted by Olivero vitiates his attempt somewhat. Unsurprisingly, the final pianissimo A flat on “venere splende” utterly defeats him (as it does 90% of Otellos - here, Kaufmann is superb), but overall this is a very creditable performance and nowhere near the bawl that some Otellos make of it. Then we move into Act 2. From now on del Monaco is on home turf. In the duet with Iago, the volcanic volatility of the character is immediately on show. “Pel cielo, tu sei l’eco dei detti miei” metaphorically grabs Iago by the throat and the incipient madness is already there in “miseria mia… amore e gelosia vadan disperse insieme”. Del Monaco manages a calmness at Desdemona’s first pleadings for Cassio which is very effective, and when he does lose composure the violence is frightening. During the succeeding quartet where he wonders if it is his own failing that have caused Desdemona’s change, he lacks the necessary introspection and self-doubt. “Tu?! Indietro! Fuggi! !” and “Ora a per sempre” show him in his element, the burnished tone conveying the character to perfection. He does lack, perhaps, the specific verbal detailing that Martinelli (for me, the greatest Otello) brings here and his “Sangues” before “Si pel ciel”, though fine, similarly lack the cataclysmic effect of the older singer, but the act is brought to a thrilling conclusion. In the “Dio ti gioconda” duet with Desdemona near the start of Act 3, de Monaco cannot quite do the ironic, icy calm that Martinelli brings to his early phrases and the “dolce” markings are ignored. Even so, as his passion rises while Desdemona continues to plead for Cassio, his accusation and cry “Giura e ti danna” are terrifying. Again, he cannot quite manage the faux-calm irony of the return of beginning of the duet, but the hurled “quella vil cortigiana che è la sposa d’Otello” is devastating. “Dio mi potevi” is less successful, far too fast. It fails what John Steane called the “A flat test”, by which he meant that the singer must not deviate from the notated pitch for the two pages until the line rises slowly to B flat then C. Otello should be numb at this point. The less thoughtful singers use this as a chance to emote all over the place, virtually making it sprechgesang (listen to McCracken in the Barbirolli recording for a truly grotesque example of this). Del Monaco is not among the worst – there is still far too much emoting here – but “Ma o pianto o duol” is very well handled. There will be much tutting at the length that he holds onto “O gioia!”, but I am sure the burst of applause from the audience would have been sufficient reward as far as del Monaco was concerned! In the final act del Monaco is on his best behaviour at his entrance, staying scrupulously to the notated pitch, only as the scene progresses does he become wilder until the murder. After, however, “Calma come la tomba” is perfectly delivered, “Niun mi tema” is again a little fast and external at the start, though it becomes increasingly involved as it progresses and is a very moving account which never descends into bathos. De los Angeles ought to be the perfect Desdemona, and there are indeed some lovely moments, but I was rather disappointed by her performance. I do not think she has the heft necessary for the part. She needs to dominate over some pretty large forces at times (for example the Act 3 concertato), but even in the quieter moments, the need to fill the vast spaces of the Met means that she often seems to be forcing her voice. She was a pure lyric soprano, not even a lyrico-spinto, let alone the full spinto that the part needs at times. As a result, the voice sometimes takes on a rather shrill edge. This is not helped by that fact that, even though tonally it sounds as though she has a high soprano, she actually had quite a short voice. She was only really comfortable up to B flat; she had a B, but it is distinctly strained, at least on the night of this recording, and the expected exquisite floating of the line happens only intermittently. She is at her best in the “Dio ti gioconda” duet and the “Esterrafatto fisso” section in Act 3 after Otello has damned her, but the Love Duet, Willow Song and Ave Maria disappoint (though there is a beautifully poised B flat at the end). Warren’s Iago is a fine performance. The part was his at the Met for over decade. He was the Iago in all eight Met broadcasts of Otello between 1946 and 1958 and would doubtless have continued to sing the role had he not died onstage aged only 48 in 1960. He had taken over the role from Lawrence Tibbett (who sang all the four Met broadcasts of Otello prior to 1946) and the comparison is not in Warren’s favour. Tibbett had a verbal insight and ability to characterise which were simply far greater than Warren’s. Warren is at his best in the Brindisi in Act 1 where a good rollicking delivery is essentially all that is required, though I was very taken with his hangdog delivery of “Avessi io prima stroncati i pie che qui m’adduser!” where he pretends to be devastated at having to tell Otello of Cassio’s drunkenness. In the conversation with Cassio at the start of Act 2, he does not approach the subtlety of Tibbett’s “matiness”. The Credo is a splendid, forthright sing, but again Tibbett brings a fanatical fury and variety of colour, for example in his sneer at pious old women. The same is true of “Era la notte” – but I would simply become tediously repetitious if I continued. Cleva’s conducting is very much of a piece with the rest of he performance. There is plenty of vim and vigour, and the storm is exciting though he does not have the cataclysmic force of Panniza (compare the two in “Dio fulgar della bufera”) or the sense of calm-after-the -storm relief in “Fuoco di gioia”. Tempi are regularly just that bit too fast for the music to make its full effect. The real sign that we are not in the presence of a true master, though, is in the careless way he treats the transitional sections between the “big bits”. He just wants them over and done with. Listen to the blankness of the phrasing between the end of the “Abbasso le spade” section and the start of the Love Duet, or the feebleness of those mountainous chords in Act 3 after “A terra e piangi!”, or the lack of atmosphere and foreboding in the orchestral introduction to the last act. Andrew Rose’s transfer is beyond reproach. The sense of atmosphere and place is palpable and there is no appreciable distortion in even the most hectic parts of the Storm or surface noise in even the quietest parts of the Ave Maria. The voices come over with wonderful presence and immediacy. It is a real privilege to be able to experience a performance from 60 years ago without any sense of looking through a veil. Although I have been critical of the rest of the cast (though only because the great is the enemy of the good), this issue has been a revelation to me as far as del Monaco is concerned. If you have been dismissive of him as I was, I do urge you to give this a go. Perhaps you too will have “road to Damascus” experience.